The 10174 AT-ST set was released in 2006 as part of the Ultimate Collectors Series (UCS) subtheme of Star Wars. This “Chicken Walker” vehicle made its appearance mainly in Return of the Jedi the third film in the Star Wars original trilogy. It’s a relatively well known vehicle. Star Wars fans will instantly recognise it and even some non-fans will know where it’s from if not what it is called. Being a UCS set you expect a model with ‘Wow Factor”, this set certainly has it, but perhaps not quite as much as some of its UCS peers. It is a little smaller than some of those, and its monotone grey color doesn’t help it stand out. Mine looks great sitting on a speaker with its UCS name plaque in front. The set makes a good first impression on those who come to see it. It may not be the largest or most detailed Star Wars model around, but it does have a decent amount of wow factor and rather than just being a generic ship, it has a bit of an X-factor by being a walking typ fighting vehicle. The UCS line of sets do not generally include minifigures. Apart from a couple of ship pilots we didn’t really have any until the 2007 release of the 10179 Millennium, where 5 minifigures were included and the ship itself was at supposed minifigure scale. It would have been a nice touch to have a pilot or perhaps even a Chewbacca minifigure included, but this was back 7 years ago and those kind of additions were not thought of at the time by Lego. The UCS line was seen as a display subtheme for the serious Star Wars collector. In terms of parts there are very few rare parts in this set and no unique parts that I could find. This makes the set a prime candidate for being “Bricklinked” from individual parts to make a whole set. This really should only effect the market for used sets though you would logically expect that to flow though a small amount to the new sets as potential buyers opt to not purchase a sealed one and make there own from parts. There are a no printed pieces in the set either. There is the standard UCS sticker template for making the information plaque and this is worth around $20 on the parts market. The rest of the set comprises of light and dark bluish grey pieces. There are a few black parts that make up the internal structure but that’s about it. There may have been some initial value here for parts collectors who wanted a lot of grey given the very good value for money which I’ll outline in a section below. Building the set from the 1068 pieces takes a few hours if you are taking your time. There are some interesting techniques as you build the legs then attach the “head”. There is a good mix of technic framing elements and traditional plates that are combined to give the proper angles required on the model. There is that familiar feeling of accomplishment when done as you look upon your work, something that Lego builders will know all about in ways that are difficult to describe. UCS models are not generally designed for playability, as you would expect they tend to put display qualities over play features. There is perhaps some opportunity with this set over and above the average UCS set. The head does rotate and you can move the legs to different positions to simulate walking or slightly different poses. The hatch on top can be opened to reveal the interior, but the interior lacks any real detail, again emphasising that this is a display model first and foremost. 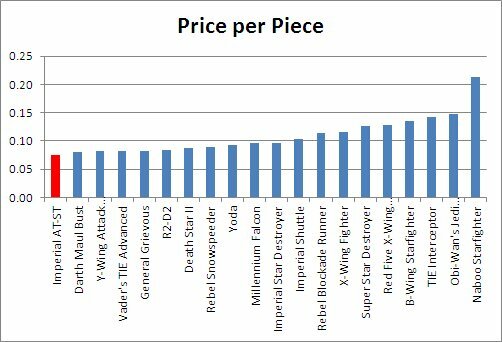 As you can see from the above comparisons, the AT-ST set is ranked 1st out of 20 against all the other Star Wars UCS sets produced in terms of price per piece – top of the pile, a great result! 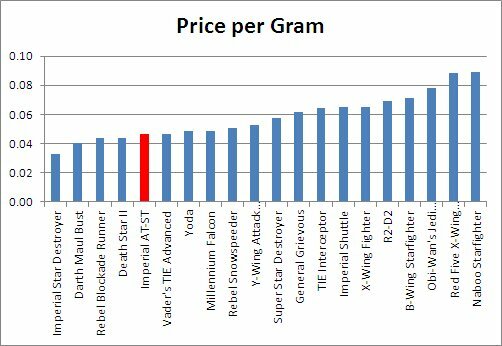 Then when comparing on weight and using price per gram, our AT-ST set slips a few ranks lower to be 5th out of 20. Still a good result. There are quite a few smaller parts included, especially to make up the legs of the model. Many other UCS models feature large panel parts on the ship type models and that isn’t really part of the design here so we can see why on price per gram the set has slipped a little. The box depicts the AT-ST standing on the right upon a background image of the forest moon Endor which is where we see the AT-ST fo the most part during the movies. There are two inset pictures on the bottom left, both quite large, that show the “play” features of the model. Not a very inspiring box for a UCS model and the inclusion of the play feature pictures is puzzling given its lack of real playability in favour of display attributes. As previously mentioned there have only been a couple of sales for the box recently averaging $42. There are no current listings for it either new or used at time of writing, so the value could vary a lot from that stated average. Never the less, it seems there is inherent value in the box itself and this has to be a factor when considering the value of a new sealed set. Choosing one with a well preserved box condition may make a difference to your final profitability here. This set has had a CAGR of 16.58% over the 7 years since its release, which ranks it 6th out of the 16 retired UCS sets we have. That is an excellent growth rate over a sustained period. This represents a return of 193% on initial investment (ROI) if you bought one at retail (or 2.9 times retail price if you prefer that measure). 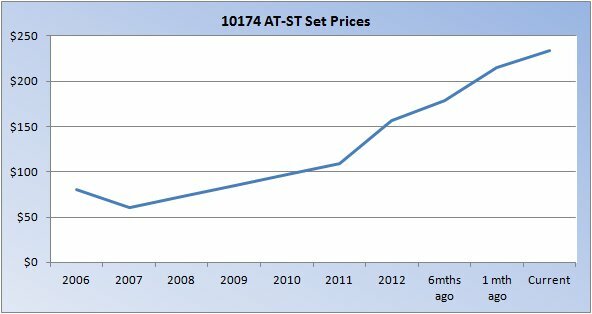 Not many Lego sets have sustained that level of price growth for such a period after the end of its retail life. If you bought the set at a discount, lets conservatively say 20% off, then that would mean an ROI of 266% (3.7 times the price you paid for it). No doubt this set would have seen such discounts and perhaps more over its retail life. In fact, as an exercise, lets look at a realistic best case scenario; 2 year shelf life at retail and a 25% off (it could even have been more perhaps?) sale at the end of its life to clear stock. So you buy it at that time and your CAGR would be 31.3%, ROI of 290% (3.9 times retail). A very good result indeed. The recent growth spike is very evident in the above picture. Incredible stuff for a set that has been retired this long. It’s almost been a “sleeper” type set for a long time and now people may have awaken to this relatively cheap older UCS set as more and more become interested in Lego investing. My thoughts are that this growth will continue in the short term and slow as the set reaches 4 to 5 times its retail price before then entering a more normal average to low long term growth phase. We only have two months to work with so there isn’t much in the way of time trends to analyse yet, but our ability to do so will improve as we move forward gathering more of this data. What we do see is a fairly wide gap of sales points for April and the narrowing for May. Condition of new sets can vary somewhat and will account for some of that price variation as a mint set will probably sell for more than a set with plenty of wear or damage to a box. Though the information does tell us that buyers are willing to pay up to perhaps $290 or more for a good set. 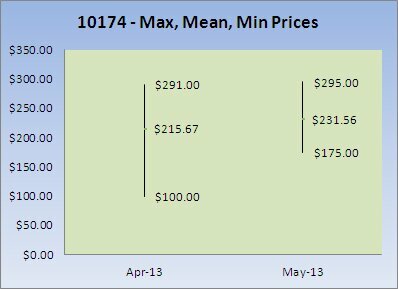 If you had a set to sell you could price it accordingly along the scale depending on your sets condition and possibly other factors such as your Ebay reputation. 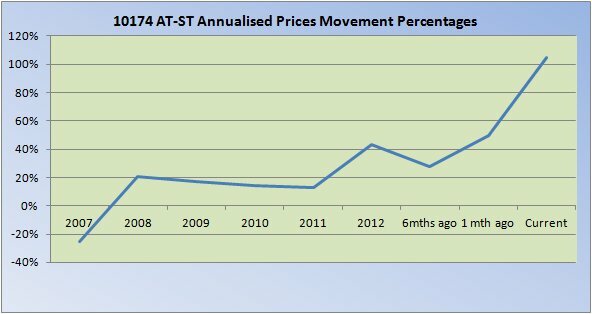 The graph also represents the 8.72% growth that was mentioned above by an increase in the mean (Current Market Price) from $215.67 to $231.56. From the evidence presented I think it is safe to conclude that this set looks like continuing growth in the short to medium term and I would recommend obtaining one or more if you can get it for the market price or below in good condition. It make be a riskier investment than some others out there as the growth spurt may disappear as fast as it appeared, but I don’t think losing value is something to be worried about at all as this set has plenty of room to move upwards. This set looks great on display as you would expect from any UCS set. It is a very good replica of a well known vehicle from the Star Wars universe. The traditional UCS information plaque sits in front and it’s always one of my favourite things about the UCS themed sets. It’s design means it stands tall upon a shelf and doesn’t require a space as large as most 1000 plus piece sets would usually. The monotone grey color scheme does mean it can get a little lost on a shelf if crowded with other grey vehicles or ships, so make sure to give it a prominent position. Mine looks great sitting atop one of my floorstanding speakers next to the TV. It’s perhaps not one of the flashiest looking Lego models and is definitely not able to compete on size with some of its UCS peers. But it does look good as a stand alone homage to a quirky fun vehicle from movie series plenty love. I have enjoyed taking a looking at this set in detail and revisiting a set from my past that I have again come to value. I took it out of storage and rebuilt it before this review and I instantly wanted to display it again. How long it stays on display may be the question though as there are plenty of Lego sets competing for my display real estate. On the other side of the scale there are some negatives, though they seem minor. Namely the smaller size and lack of a little detail compared to some UCS sets, and the monochromatic look. On balance though I would conclude that the positives far outweigh any negatives and this set looks like a solid buy recommendation, even at current secondary market prices. Catch this current wave of growth while you can! Get an AT-ST STAT!